Lot of our customers come to us for Structured cabling. We hear a lot about structured cabling these days but what exactly is the meaning of this term and where did this originated. Before the early 1990’s, there was no specific standard of cabling and it lacked flexibility and was not standardized. The cabling was not specific and there was no standard approach. Cabling was done in parts which sometimes would lead to complete complete Chaos. In 1991, the telecommunications industry Association and Electronics Industries Alliance published the first version of the commercial building telecommunications cabling standard. Structured cabling follows same protocols and standards which are devised by organization’s that include the American National Standards Institute, Electronic Industries Alliance, Telecommunications Industry Association, International Organization for Standardization, NEMA and more. As long as manufacturers follows the specifications and protocols laid down by these organizations, their devices should work with other networking devices without any problem. The TIA covers some standards that include subsystems of structured cabling, installation methods and practices for data cabling, connecting hardware performance specifications, recommended topology and distances and more. Equipment rooms and entrance facility. Horizontal cabling is a is a cabling that extends from the horizontal cabling to the work area and dominates in telecommunications outlets. Horizontal cabling includes the following. Cable from patch panel to the work area, any communication outlets, cable terminations, cross connections that ever permitted, a maximum of one transition point and cross connects in telecommunications rooms are enclosures. Backbone cabling is necessary to connect entrance facilities equipment rooms and telecommunication rooms and enclosures. It consists of cables that connect the telecommunication rooms, equipment rooms, building entrances and the cross-connect cables, mechanical terminations or patch cards used for backbone to backbone cross connection. The work area is where the horizontal cabling terminates. 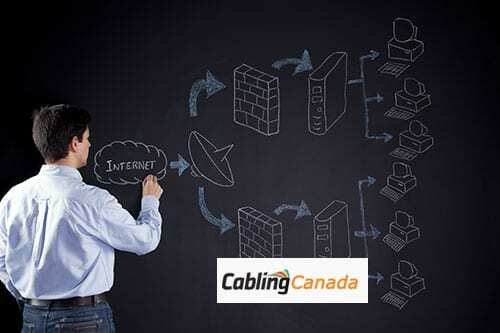 In the work area, the users and the telecommunication equipment connect to the structured cabling infrastructure. The work area begins as a telecommunication section and includes components such as patch cables, model of cards, fiber jumpers and adapter cables. It also includes station equipment such as computers, telephones, fax machines, alarm and more. The telecommunication rooms in enclosures is a location within the building their cabling joints such as cross connects and patch panels located these other rooms where the horizontal structured cabling sites from and may also contain networking IT Equipment s such as Hubs, Switches, routers and patch panels. The equipment rooms is a centralized space specified to house more sophisticated equipment than the entrance facility are the identification rooms backbone cabling is specified to dominate in the equipment room. Entrance facility is the point in the building where cabling connects with the outside world. All external cabling such as campus backbone, interpreting and telecommunication provider should enter the building and existing it in a single point. TIA recommends a dedicated entrance facility for buildings with more than 20,000 usable square feet. As a leading and trusted Structured Cabling company, we are well aware of new technologies and challenges in the cabling Industry. With our experienced technicians, cabling is an easy job.